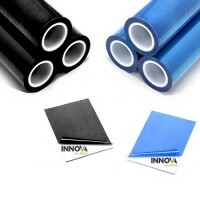 Innova Surface Protection Films & Tapes assure excellent surface protection from scratches and scuffs with no residual surface deposits left on removal from the contact surface. Innova Surface Protection Films & Tapes are suited to Aluminium, Stainless Steel, Plastics, Glass and most coated materials. The critical property of surface protection films, aside from protecting the surface, is that no adhesive residue should be evident on tape removal. To obtain the best results using NovaBond Surface Protection Films & Tapes, ensure the surface is clean, dry and free from oil, grease or any other contaminant that would be detrimental to accepting the product. Cleaning the surface with a non-residual cleaning solvent such as Novabond Surface Cleaner will aid the adhesion of the film or tape to the substrate surface.